Nearly two months ago WordPress 4.0 was released. It came with tons of new improvements like an enhanced post editor, improved internationalization support, embed previews, etc. WordPress 4.1 is expected to be released in the second week of December, 2014. It is coming with lots of changes and a new default theme. 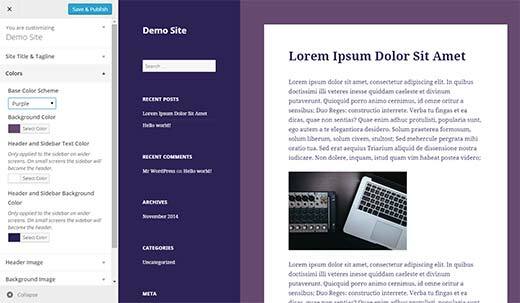 In this article, we will show you what’s coming in WordPress 4.1 with features and screenshots. You can test the beta version on your computer or in a staging environment by using the WordPress Beta Tester plugin. 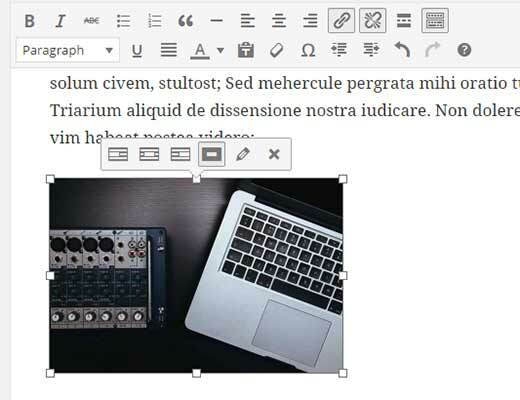 WordPress 4.1 will arrive with a new and improved distraction free writing mode. Many beginners usually don’t know about the distraction free editor, and those who know about it don’t find it very helpful. The new distraction free writing mode makes it much simpler to switch back and forth between normal writing mode and distraction free editor. You will notice that the metaboxes and WordPress admin bar will slide out of view and will remain hidden as long as you are writing. As soon as you move the cursor away, the admin bar and meta boxes will slide back in. This feature is enabled by default in the beta version. However, it will not be enabled by default in the final release and users will have to click on the distraction free button on the screen to enable it. 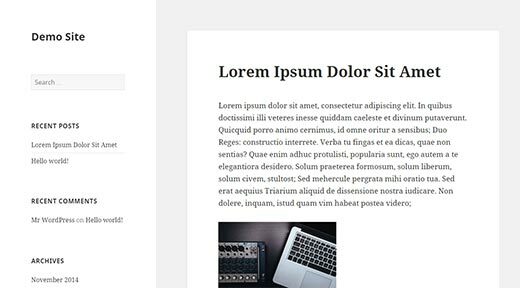 WordPress beginners often find it difficult to align images in WordPress post editor. With 4.1 users will be able to click on an image and instantly see alignment options along with a button to remove alignment. The pencil button is still there which will open the image into a popup where users can further edit an image. 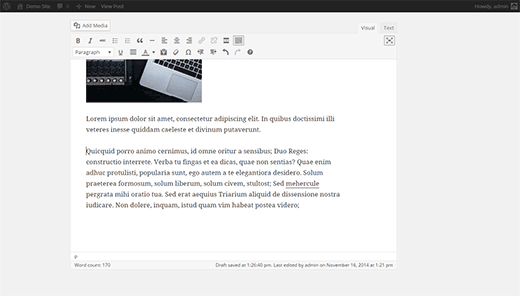 Keeping up with the tradition of at least one new default theme every year, WordPress 4.1 will ship with Twenty Fifteen the new default theme for WordPress. Twenty Fifteen is a simple blog theme with emphasis on typography. It uses Google’s Noto Serif and Sans fonts which support many languages. This makes Twenty Fifteen ready to be used with any language without changing fonts. Using theme customizer, users will be able to select from different color schemes, add background image, change header, etc. Allowing users to quickly and easily modify the default theme and make it their own. WordPress 4.0 introduced language selection during the installation process. Which provided an out of box localized experience for users. WordPress 4.1 will make it even more easier, as users will now be able to change the language from Settings » General screen. Simply select the language you want to install from the dropdown menu and save settings. 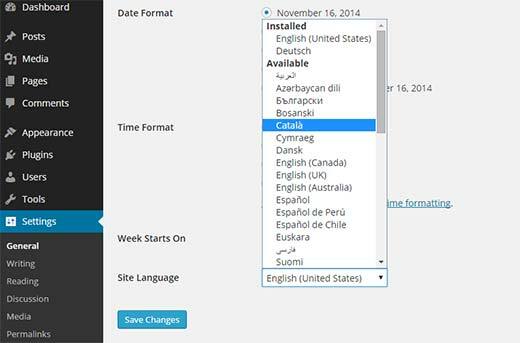 WordPress will automatically download and install the language packs for you. WordPress 4.1 has many new features for developers to play with. Title Tags – New title tag for WordPress themes will allow theme developers to explicitly define a site’s title and avoid conflict with the WordPress title tags. Query Improvements – Rewritten and improved meta, date, comment, and taxonomy queries in WordPress 4.1. 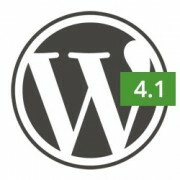 We hope this article summarized what’s coming in WordPress 4.1. Let us know which features you are excited about and what you would like to see in the future release of WordPress? But I can not that option for language park below the week starts on menu. Will there be integrated JSON REST API? From my understanding the jury is still out on this one. This topic on the Make WordPress Core (https://make.wordpress.org/core/2014/11/13/dev-chat-summary-november-12th/) suggests that feedback from the beta will determine if it’s defaulted to on, or optional. The distraction free mode is a welcome change ! I would like to see a much more friendly wordpress.com for business site building. WordPress is very much for blogs, and I get that but since you have the business upgrade and option to do business through a wordpress.com, I’d like to see more features on that end. If I want a more customized business site, I have to use wordpress.org widgets and have a serious know how to do so & right now the only real difference between “free” & $299 a year is the addition of a shopping cart by means of one of the two widgets offered. The premium themes are nice and all, but I need more out of the business end. Humm… The business plan provides quite a bit more than what you have listed. Also the business plan is meant for those that don’t want to do all the .org stuff, like upgrading plugins, maintenance, finding a good host, security… The list goes on and on and on. Why not go with another provider if you’re so discontent with .com? Why even bother complaining on this site? Further explanation, please, for Image Alignment – specifically “remove alignment”. What exactly is the advantage and what will this actually do? From the screenshot, it would be the same thing, left, right, center, then block-center. Only difference if that you won’t have to go to the media manager to change it.